Pingree girls’ ice hockey participates in the Eastern Independent League alongside Beaver Country Day School, Berwick Academy, Dana Hall School, Newton Country Day School, Portsmouth Abbey School, and Winsor School. Other common non-league opponents are Groton School, Hebron Academy, North Yarmouth Academy, Proctor Academy, St. George’s School, and Tilton School. The girls play a 22 game schedule and host an annual holiday tournament in December. This tournament is a highlight as it involves local public and private schools as well as a skills competition. Pingree also travels to Canada biannually to play hockey and visit popular sites in Montreal. Pingree coaches emphasize teamwork and respect, teaching all skills of the game from skating to shooting, and strive for the girls to improve every time their skates touch the ice. We are looking forward to another successful season on the ice! Pingree girls have gone on to successful college hockey careers at the varsity and club level at: Buffalo State, Connecticut College, Cornell, Middlebury, RPI, Salve Regina, Sacred Heart, Skidmore, St. Lawrence, St. Michael’s Trinity, Union, University of Maine, University of New England, and Williams College. Jim MacLaughlin has had a long association with Pingree hockey. A 1984 graduate of Pingree, Jim was the first winner of the James C Deveney Award, and was named a Beverly Times All-Star while a student. 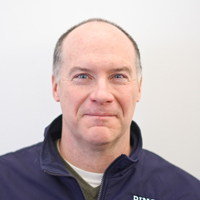 After playing at Union College, where he was a member of the 1985 ECAC West Championship team, Mr. MacLaughlin returned to Pingree in 1988 as an English teacher and was the founding coach of the girls varsity ice hockey program. As the girls coach, Mr. MacLaughlin won seven EIL championships, was named coach of the year several times, and served as the first EIL Girls Hockey Commissioner for fifteen years. Mr. MacLaughlin moved to coach boys hockey in 2007, and has also coached for Beverly Youth Hockey and the Middlesex Islanders. Bob resides in Hamilton with his wife and two daughters and is currently the COO at Lark Fine Foods in Essex, MA. Bob also serves on the Boards of Glen Urquhart School and the North Shore Nordic Association. His accomplishments on the ice include an ECAC North-Central-South Championship as captain of his University of Massachusetts-Dartmouth team. Bob was a 3x New England Hockey Writers All-Star, 3x ECAC All-Star, ECAC Player of the Year and winner of the prestigious J. Thom Lawler Award. Additionally, Bob has been inducted into the Malden High School and UMass-Dartmouth Athletic Halls of Fame. Over the past several years, Bob has coached for the North Shore Ice Hawks and Islanders Hockey Club while competing in dozens of marathons and triathlons including the Ironman World Championships in Kona, Hawaii.